App review of LurnQ which is unified, socially styled and open online learning platform for learners and teachers. What do we do when we want to update our knowledge on a certain topic? I would Google and trust a Wikipedia source if there is no relevant blog post. Now this process is not always the best way since it takes time and you don’t know whether the first five links would have your answer. Smart SEO chaps can always fool you. But, what if you are taken to a platform that can increase your knowledge and let you share your knowledge too? Well LurnQ, a Mumbai based startup is aiming to solve this problem with the power of social features. 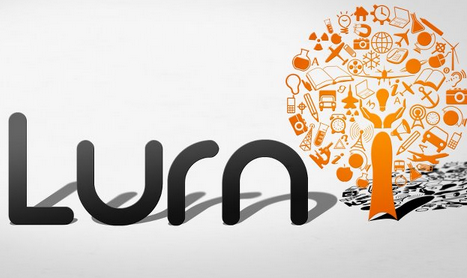 LurnQ allows you to log in via social networks like Facebook and Twitter. Once the authentication process is over, the platform asks to select a minimum of three interests from a bunch of topics such as Books, Entrepreneurship, Digital Marketing, etc. After you’ve made your choice of interests, you are given a list of people to follow, who are already connected to you depending upon the choice of the network during the log in. I used my Facebook login so LurnQ pulled out more than 20 friends who are already using the platform. You can either add some of them or do so at a later stage. With this step you are all set to explore the platform like I did. 1. Learn: Neatly designed LurnQ allows you to learn from others. 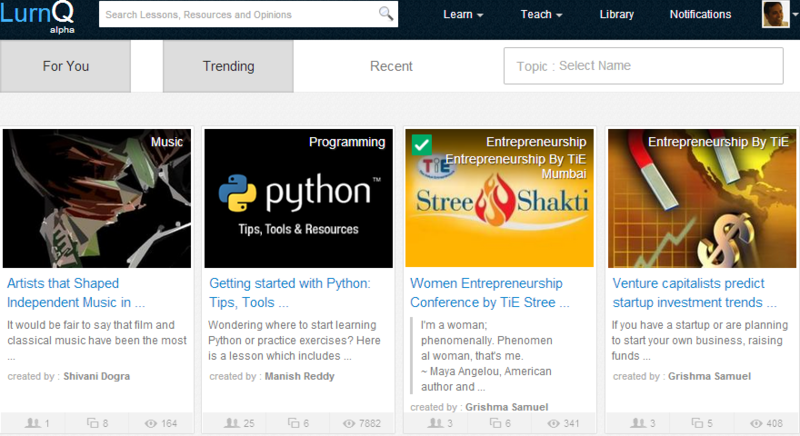 Click on the Learn tab and you are populated with – i) Explore Lessons and ii) Explore Opinions. On click of any lesson, you are presented a more detailed view of the content. You get to know the number of content posted under the category, how many people are following the content, the total number of views and the user profile details too. You can click on individual content, read it, vote it if you like it and you can share your comments too. For example, I clicked on a content that was trending and gave information about the artists that shaped independent music in India. While you are reading this, the platform provides a list of associated content, similar users you would like to follow and sharing the content on social networks. 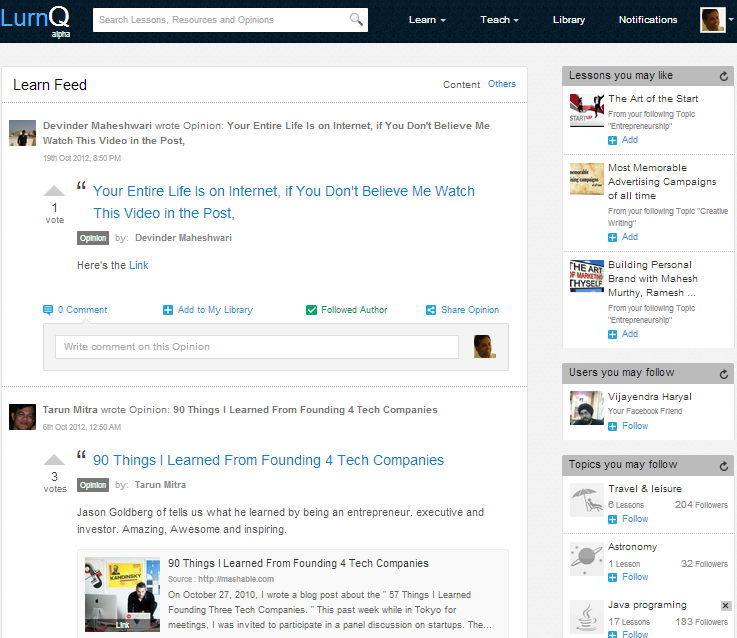 Explore Opinions has the similar layout as Explore Lessons. So you would see similar features like For You, Trending and Recent. However, the big difference is that – in this section you would find people expressing thoughts on an existing content, article, etc. while they share on the platform. With every opinion you can comment on it, add to your library, follow author or share it. You can also vote the opinion if you like it. 2. Teach: This section is about a user’s contribution to the platform. Teach is further sub-divided into two major sections -i) Create Lesson and ii) Write Opinion. Create Lesson is a simple process where you can share your knowledge that you want to share on the platform. Along with the main lesson you also need to add the relevant sections to it and you can add resources to your content from the platform or by giving a link. Writing opinion is similar to where you need to provide details about your opinion, category and the resources that need to be added with the opinion. 3. Library: Library, as the word is expressed, means the same on LurnQ. It is a store house of all the activities performed by you on the platform that could be related to lessons, opinions, resources, added URLs and topics. The below screen grab gives a quick look of my Library on LurnQ. 4. My Profile, Feed and Settings: The final section is all about the personal details of the user. My Feed is a section that will show you an updated feed which informs what are your friends doing on the platform. My Lessons, as the name goes, gives a snapshot of the lessons created, in draft, published and being followed by you. My Profile is a quick snapshot of the personal details such as number of topics being followed and other personal details. Can’t help it but these days whenever I come across such knowledge portals, my first question is – is it a rip-off of Quora? Thankfully LurnQ is not doing that but some features are similar which can’t be helped. However, LurnQ has two major challenges – i) The platform itself, and ii) User traction. The beauty of the platform is that it survives on a crowdsourced method but if not monitored then the platform could result in marketing gimmicks and a space of spam. Additionally, as a user I am also in a dilemma whether the lessons that are being shared are genuine or not. Voting mechanism helps but adding feature like experts on specified domains while one is searching lessons would be great. User traction could be a challenge when the online population of India is stuck on Facebook. Integrating social networks could give a boost but then sharing each activity might be annoying for users like me who are already struggling with the cluttered news feed of Facebook. But according to NextBigWhat, the startup is getting 30,000 unique visitors a month and more than a third are returning visitors which should be a positive sign for LurnQ. Presently the platform is expecting to work on a freemium model as shared by ProductNation. A premium version is on the cards for a private or a closed community of individuals. The startup also plans to launch the platform on popular mobile devices too. 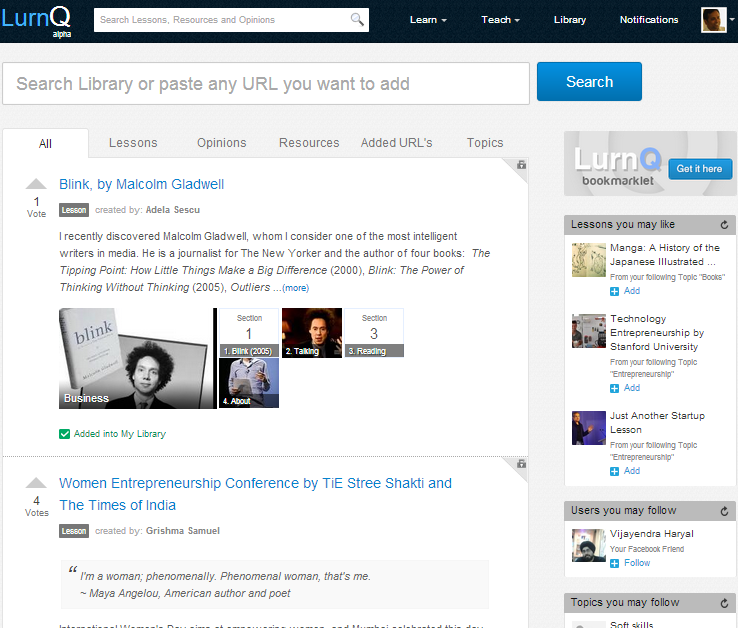 Will you log in LurnQ for your knowledge upgrade next time or are you happy to search on Google or ask on Facebook?